Below is a travel packing checklist. This should help you pack for any trip. Just vary it as you feel depending on where and when you are travelling. Clothing should be able to be layered, lightweight and quick drying so that it can be used in the variety of weather conditions that you may encounter. Research the weather and climate of the destinations you will be travelling before you go. Don’t bring clothes that need to be ironed. Down jackets are good as they can be stuffed in to pack. Good walking boots make the trip much more pleasurable if there is a lot of walking involved. With walking boots it is a matter of going into an outdoor shop and testing the boots out. There are a variety of lightweight waterproof toiletry bags available these days that make it easy to carry your toiletries. Ensure that all gear does not exceed 20kgs per person (less if your flights have lower weight limits). If you can manage 10kgs, then you may be able to carry on your luggage. If you have breakables, pack them in socks and clothes. Stuff sacks, travel organisers and compression sacks can be useful in making more use of the space available. Keep your money safe when travelling! When travelling, learning how to keep your money safe is one of the most important things. I have seen many travellers reduced to begging when they have lost all their money and or possessions. I have had a boys hand on my wallet in my front pocket in an attempted pick pocket and have managed to keep relatively safe. However, I know of people who have had credit cards charged many times the price of the service and have been seduced by many scams that led to them losing their money. I prevented a gypsy from taking all the vacation money from a pair of Swedes in an Italian train station scam. 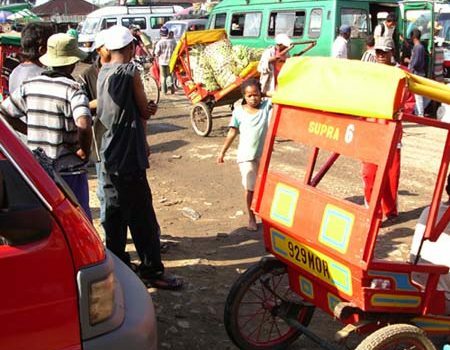 High levels of petty theft occur even in countries that are considered extremely safe to travel. For example Belgium and Spain often occur at the top of the list of thefts per population yet are considered some of the safest countries to travel. To ensure that you keep your money is safe, there are a number of precautions that you can take. 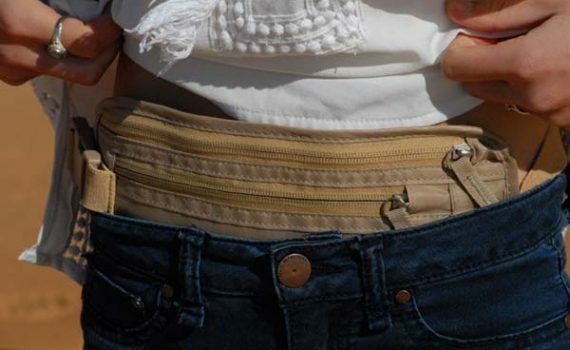 A money belt that is hidden under clothing. You wear it inside your jeans and under any shirts and jackets that you are wearing. Your passport, spare credit card, medical vaccination certificates (if required) and some cash are kept in the money belt. Moreover, an RFID money belt stops your credit cards and passport being read. A normal looking belt with a hidden compartment. This holds a small amount of cash to allow you to survive for a day or two if necessary. Travel Ideology has its own brand unique high quality dress leather belt that offers this function. A wallet with the day’s cash and a credit card, generally carried in the front pocket. Back pockets are an easy target for pick pockets. If mugged, you can give away the wallet without serious implications to your trip. Keep some money inside your main pack and ensure that your main pack is locked and locked to a piece of furniture when in a hotel room whenever you are not there. In many countries, the money that you take for your two week or four week vacation is enough for someone to live on for a year. Handbags scream out to thieves as easy targets. In Kenya, I travelled on a tour that was delayed for 3 days because one lady brought a handbag and took her eye off it for a few seconds. Some people prefer to use a hotel safe. However, remember all hotel safes are designed so that they can be easily opened by the hotel management when the guests forgets their password. With this in mind, is it the safest spot for your valuables? Day packs are often used when travelling. Minimum money should be carried in a day pack. If used, they should be carried on your front rather than on your back, especially in busy areas and markets. Also, when stopped for lunch, you should wrap the strap around your leg so that you will feel it if someone tries to take it. Some newer day packs include metal mesh inside the pack to stop the straps being slashed off and the pack from being opened with a knife easily. There is a trade off of extra weight for more theft proof. Do you look like a local? Thefts occur in highly touristed areas and on trains and transport hubs. Where there are lots of people, you may feel someone bump into you. Later, you will notice your wallet is gone or your bag has a hole in it with something missing. Someone may have come to help you when you looked lost and had a map held up in front of you and they have helped you out of your money (most people genuinely do want to help but do be aware that not all people do to be safe). Generally walk against the traffic. In some areas of the world, pick pocketing take place by way of motorcycle. Thefts also occur in areas where there are no other people. This means in dark alleyways or at night in areas where nobody will hear you yell out for help. Know the districts to keep away from. If you do need to walk through these areas walk down the middle of the street or the opposite side of the road to the people. If you see someone cross the road to meet you, cross over to the other side of the road or walk into a shop or catch a taxi, a bus or train out of the area. Walk at a fast consistent pace. Above all in these situations, look like you know what you are doing and where you are going, even if you don’t. Be aware of people around you at ATMs. Be aware of card skimming technology that can be used to access your card details. There have been cases of hidden cameras at ATMS to record your pin number. People can empty your bank account with card skimming and RFID skimming technology and whilst many banks may pay back the money if you can prove it was not you accessing the back account and you were not negligent, that may not happen until after you need to use the money for your holiday. These are not really used these days. Most people do not know how to use them and they will take longer to negotiate. Better to use credit cards and cash. There are many scams designed to separate the traveller and their money. Be aware of the scams that are being perpetrated, especially in the area you are travelling. Many of these involve taking you away from other people and can then involve drugging you (eg tea in Shanghai) or physically taking the money (Kenya and other parts of Africa). In Italy, beware of gypsies , especially at railway stations. There are scams where a woman shows off her baby and before you know it she has helped herself to your money. Keep the phone numbers and details required to obtain replacement cards in your money belt should something happen. Also, you should be be aware that whilst some credit card issuers can organise replacements relatively quickly, other can take weeks. Always carry at least one spare credit card (or prepaid credit card). Christmas Shopping List for the big trip. There are a number of travel accessories that everyone needs on their Christmas shopping list for the big trip. Here are our pick. Travel More for Less helps people to travel the world, seeing and experiencing more for the same or less cost than they otherwise would have spent. It is the quintessential guide to planning and implementing any trip. It brims from cover to cover with tips that will save you money, expand your travel horizons and keep you safe no matter where you want to travel and at what standard you want to do it at. You need a Travel Towel. It is essential for any long term trip. The advantages of a high quality travel towel are that it will be compact, lightweight, quick drying, super absorbent, strong a durable, soft or the skin. 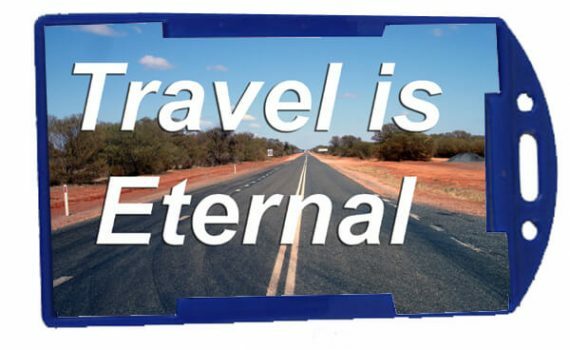 Moreover, Travel Ideology’s travel towel is the best available in the market. You need a Money Belt to keep your money, passport and credit cards safe and on your person. These days that means something that is RFID safe as well. The Travel Ideology Money Belt represents excellent value for money and is RFID safe and comfortable. You need to a Small Pen to complete your arrivals forms, make notes, take people’s phone numbers or write something on a card for someone. It needs to be small enough that you can keep it with you at all times. For every long term or remote trip, you need to be prepared. A good First Aid Kit will get you out of trouble. Moreover, the Travel Ideology first aid kit is designed specifically for this use.